Recorded Live at Radstadion, Ludwigshafen, Frankfurt, Germany - September 06, 1975. Very Good Audience Recording :: Bootleg Silver CD :: CBR 320 kbps & FLAC. Files: 12. :: Size: 157.95 MB (mp3) / 403 MB (flac). 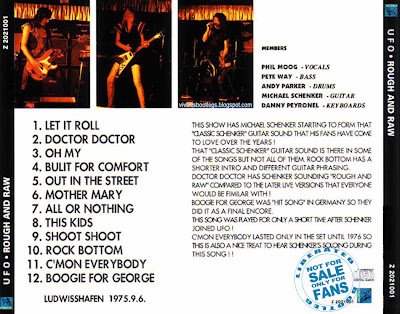 Personnel: Phil Mogg - Vocals :: Pete Way - Bass :: Andy Parker - Drums :: Michael Schenker - Guitar :: Danny Peyronel - Keyboards . 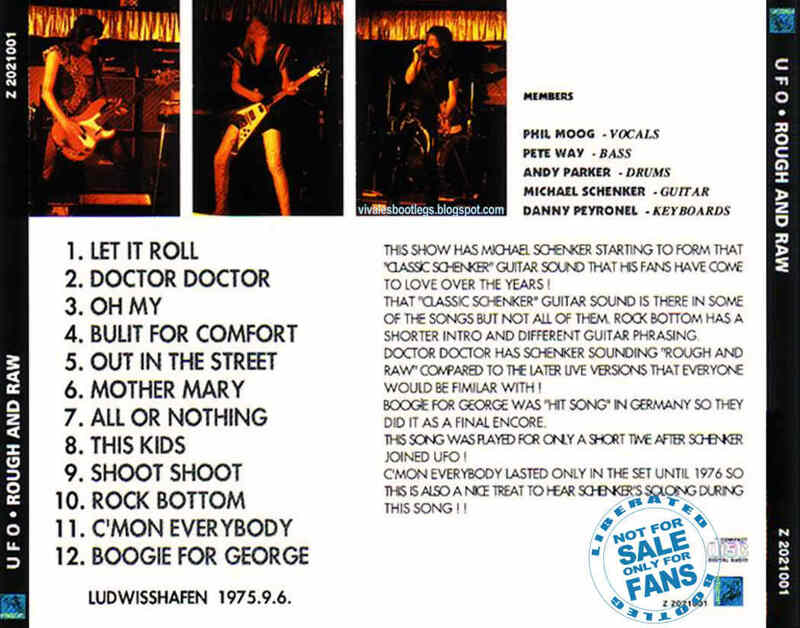 Notes: The performance is excellent, the core members of the band, Phil Mogg Pete Way Andy Parker and Schenker work as a well oiled machine. The band opens with a strong number from the new album, Let It Roll that plows over the audience, the band sounds very powerful in this recording with Michael recreating the solo for the record sounding at times like two guitar players. Doctor Doctor is well received and played early into the set, not quit the end of the set signature tune that it would become. 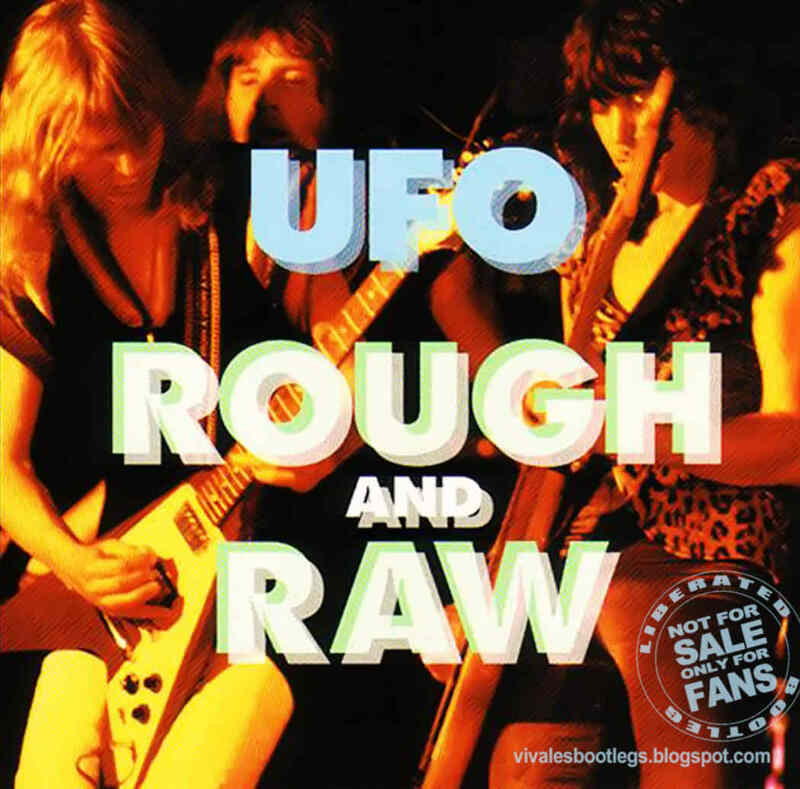 Ufo boots from the 70s are rare to find in the net.Tahnk you very much!